As we wind up Make a Difference Month, I want to encourage you to do something BIG for someone today or plan it today and do it later this week!! *Send flowers to your wife. *Make a special dinner for your husband. *Make cookies for your kids. *Watch a movie with your family. *Take a friend to lunch. *Buy coffee for your co-workers. *Give a gift to a friend. *Give an extra tip to a server. *Give a goodie bag of socks, toothbrush, toothpaste, snacks, gum and other treat to a homeless person. *Give a gift certificate for food to a homeless person. *Show love to your clerk at the check out. *Plan a party or a bigger act of kindness for later this week or in a couple of weeks to make someone special feel EXTRA special. Thank you for participating in the Make a Difference month and I pray that this will be a month that will bring awareness to us encouraging us to make a difference to someone everyday and that creating kindness will just automatically become a part of our life. Let’s go change the world one act of kindness at a time. 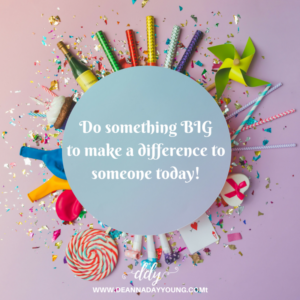 This entry was posted on February 28, 2018 with tags: #capturekindness, #kindnessmatters, #makeadifferencetosomeoneeveryday by Deanna Young. Time To Pick Up The Phone. 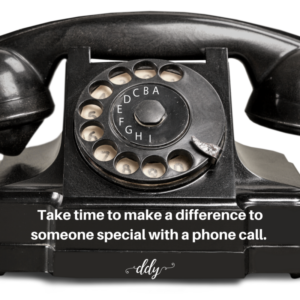 Today make a difference to someone very special to you by giving them a call and spending a few minutes chatting. This entry was posted on February 27, 2018 with tags: #capturekindness, #kindnessmatters, #makeadifferencetosomeoneeveryday by Deanna Young. What is that? Good old-fashioned conversation? It’s where you sit in the same room with someone and look at them and talk. Yes that’s correct. Words come out of each other’s mouth while the other listens and you engage in conversation face to face. No cell phone. No texting. No Instagram. No Facebook. No Snapchat. I was in a restaurant this week and looked around at all the people on their cell phones. Families weren’t talking but were all on their devices. If a child starts fussing, we don’t try to make them laugh. No, we give them an electronic device. Our 2-year children can find the app to play the game on the adult’s cell phone faster than we can. 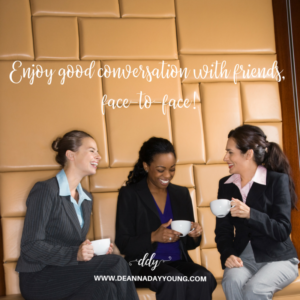 We’ve lost the art of good old-fashioned, face-to-face conversation with others. The suggestion for today is to make a difference to those you are with – to be present, in the moment, cell phone put away and just talk and listen and have a good old-fashioned conversation. This entry was posted on February 25, 2018 with tags: #capturekindness, #kindnessmatters, #makeadifferencetosomeoneeveryday, #nocellphone by Deanna Young. Long. Short. Curly. Straight. Blonde. Brunette. Redhead. Highlight. Perm. Angle. Taper. Stacked. Bangs. The language of a hairdresser. Hairdressers don’t get enough credit, in my opinion. We customers go in with our Pinterest® perfect picture and just assume we will come out as the next top model. Hairdressers have to learn a lot of things to work their magic on us. And I know mine deserves a lot of credit. In continuing with our Make A Difference Month in February, I encourage you to do something special for your hairdresser. Let them know how much you appreciate them as they work their magic to make you look fabulous! Thank you, Brenda Lamping from Precision Hair Design for all you do for me! 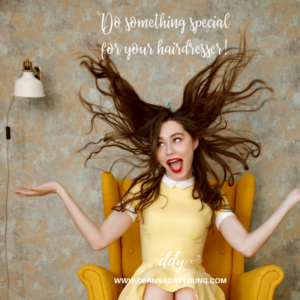 This entry was posted on February 24, 2018 with tags: #capturekindness, #kindnessmatters, #makeadifferencetosomeoneeveryday, #thankahairdresser by Deanna Young. With the recent shooting in Parkland, Florida and all the stories that follow about teachers and coaches protecting their children, I can’t help but think about how the roles of teachers have changed over the years. When I was growing up in a small rural community, we thought of teachers as those who taught us and loved us. They cared about our families and were able to take us home from school if we missed the bus or our mom got sick. They were like part of the family. We didn’t have to worry about teachers protecting us from gunmen. The world is different now. Social media, technology, movies and video games have changed all of those dynamics. Studies have shown that all of these things combined have caused the dangers of just the mere fact of going to school to increase. Our teachers have to be prepared to do more than teach and show concern about our kids. They have to be ready to defend against evil and bullets and knives and down right craziness! I have always respected teachers and the role that they play in our lives and our children’s lives because frankly, without them we could not survive in the world. Think about a teacher that you had growing up who made a big impact on your life or a teacher that went over and above to help your child through a difficult course or time in their life. My challenge to us today is to THANK A TEACHER. Write a note, send a small gift of appreciation or go back to basics and pick up the phone and give them a call. My heart goes out to all those teachers who had to experience tragedy in all of the school shootings over the last decade and I want to thank them for their service to society in their role of teachers but also for their service to society as their expanded role of protector. This entry was posted on February 23, 2018 with tags: #capturekindness, #kindnessmatters, #makeadifferencetosomeoneeveryday, #thankateacher by Deanna Young. Jesus never met a stranger. Even though He may not have had a relationship with every person He met while on earth, He was always open to becoming a friend, helping anyone in need and developing a relationship with anyone who wanted to know Him. Jesus tells a parable to the experts in the law who were trying to test Him. The story is about a Good Samaritan who helped a man who had been beaten and left by the side of the road to die. Two other people had passed him by but the Samaritan took pity on him and bandaged and treated his wounds. But he didn’t stop there. He took the beaten man, on his own donkey, to an inn and took care of him. Then one step more… he left the man and paid the inn keeper to care for him and he paid all extra expenses. We should be the same. Can you imagine how much better of a world we would live in if everyone was willing to show kindness to everyone they met? My challenge for us today is to look for ways to be kind to a stranger. Start small. Allow someone to go in front of you in line at Wal-Mart or a restaurant or coffee shop. Let someone merge in front of you in traffic. Compliment a stranger on their outfit or hairstyle or their children. Let’s show a little of Jesus by pretending, just for starters, that we never met a stranger along our journey in life. Together we can change the world one small act of kindness at a time. This entry was posted on February 22, 2018 with tags: #capturekindness, #kindnessmatters, #makeadifferencetosomeoneeveryday by Deanna Young. 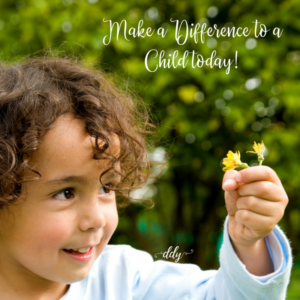 Today’s suggestion is to make a difference to a child. Children are always looking for the gift of time. Here are a few suggestions but I’m sure you have some of your own. Enjoy making a difference to that little someone special in your life. Anything that you enjoyed as a child, think about passing along that memory and making a new memory by giving the gift of time to another child. We really can make a difference and change this world, one act of kindness at a time! This entry was posted on February 21, 2018 with tags: #capturekindness, #kindnessmatters, #makeadifferencetosomeoneeveryday by Deanna Young. Everyone loves a surprise and a sweet treat. As we continue Make A Difference Month in February, take time to treat a special person or a stranger-turned-new-friend to an afternoon coffee, latte, soda, cookie, brownie or healthy snack. It’s your choice! Pick a treat. Pick a person. And show some sweet kindness today! This entry was posted on February 20, 2018 with tags: #capturekindness, #kindnessmatters, #makeadifferencetosomeoneeveryday by Deanna Young. 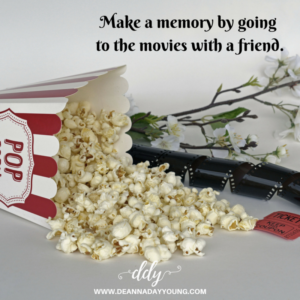 Today’s Make A Difference Challenge is to grab a friend and take them to the movies on your dime. Maybe even buy some popcorn and candy to share! Let’s go change the world one act of kindness at a time. This entry was posted on February 19, 2018 with tags: #capturekindness, #kindnessmatters, #makeadifferencetosomeoneeveryday by Deanna Young. Awwww – what a powerful word. That brings so many questions. 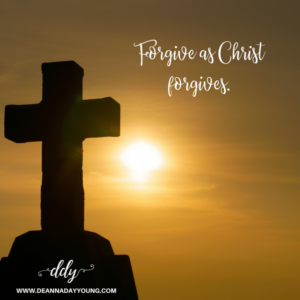 How do we forgive? What if the person doesn’t want forgiveness? How can I forgive if I don’t want to forgive? What if I forgive but the person doesn’t care? Matthew 6:14-15 – For if you forgive other people when they sin against you, your heavenly father will also forgive you. But if you do not forgive others their sins, your father will not forgive your sins. It’s hard but it’s required by the Ultimate Forgiver. Today’s Make A Difference challenge is to forgive someone – even if they don’t want it, don’t care, or don’t accept. This act is about YOUR act of forgiveness and in turn, hopefully others will forgive as you show Christ’s love by changing the world one act of kindness at a time. This entry was posted on February 18, 2018 with tags: #capturekindness, #forgiveaschristforgivesus, #kindnessmatters, #makeadifferencetosomeoneeveryday by Deanna Young.